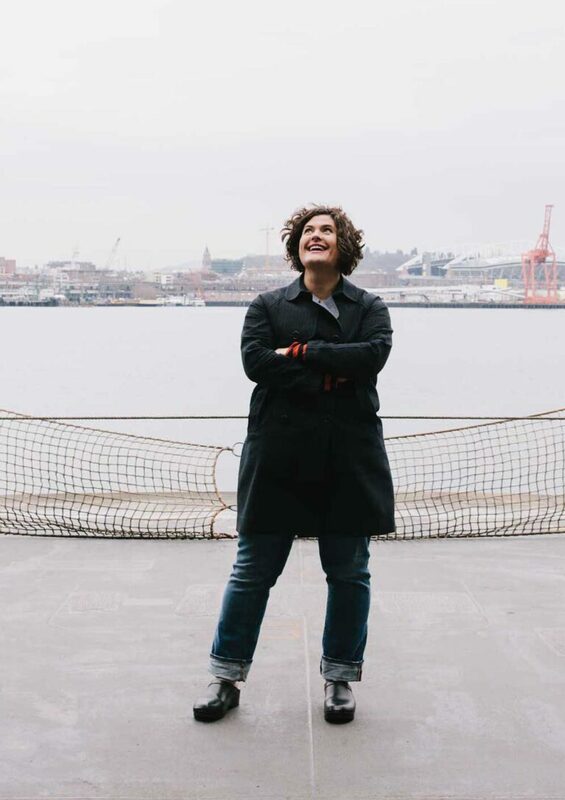 The James Beard Award–winning chef (shown here on a Washington State Ferry) talks Pacific Northwest food, local watering holes, and her favorite way to eat an oyster. What do you enjoy most about Seattle’s culinary culture? As a chef, the community is amazing. As far as the food, there is tremendous diversity and the variety of quality ingredients is impeccable—better than almost anywhere else. Every year the bar is set higher, with people becoming more invested in where their food is coming from. It makes my job that much more exciting. Where do you take visitors to show off the city? Discovery Park (3801 Discovery Park Blvd; seattle.gov/parks/find/parks/discovery-park) is a beautiful spot, and I love the Olympic Sculpture Park (*2901 Western Ave; seattleartmuseum.org). It’s an epic place to see art in an urban setting. And we’ll usually catch a ferry to Vashon to visit a few farms. Where should you go to start exploring the local food scene? I’d say the farmers markets. Ballard has a great one, and I like getting to Pike Place Market (*First Ave and Pike St; pikeplacemarket.org) early in the morning, around 8 or 9am when the vendors are just setting up, and strolling through with a cup of coffee. Walk down into the Chinatown–International District just to see all the Asian food. What are your go-to spots for food and drink? Essex (1421 NW 70th St; essexbarseattle.com) in Ballard is my neighborhood bar. Gracia (5313 Ballard Ave NW; graciaseattle.com) is doing a really great job—they care a lot about the ingredients. Chef Matt Dillon’s new place, Upper Bar Ferdinand (1424 11th Ave; barferdinandseattle.com), too. His flavors are truly his own. Manolin (3621 Stone Way N; manolinseattle.com) in Fremont has excellent raw fish, and Maneki (304 Sixth Ave S; manekirestaurant.com) in the Chinatown–International District is another favorite. Do you have a favorite way to eat an oyster? Naked, shucked, with no sauce. Ideally I’m standing on Hama Hama Beach at the Hood Canal with an oyster knife in hand, eating them straight off the beach. Traveling. But on a day off, I’m cooking dinner for my family and eating it on the back patio with ingredients I’ve picked up from the farmers market that morning.